Presumably there are many of his artworks in the Grimsby School of Art and in North East Lincolnshire. Some of these can be seen on http://www.bbc.co.uk/arts/yourpaintings/artists/albert-edward-wade. 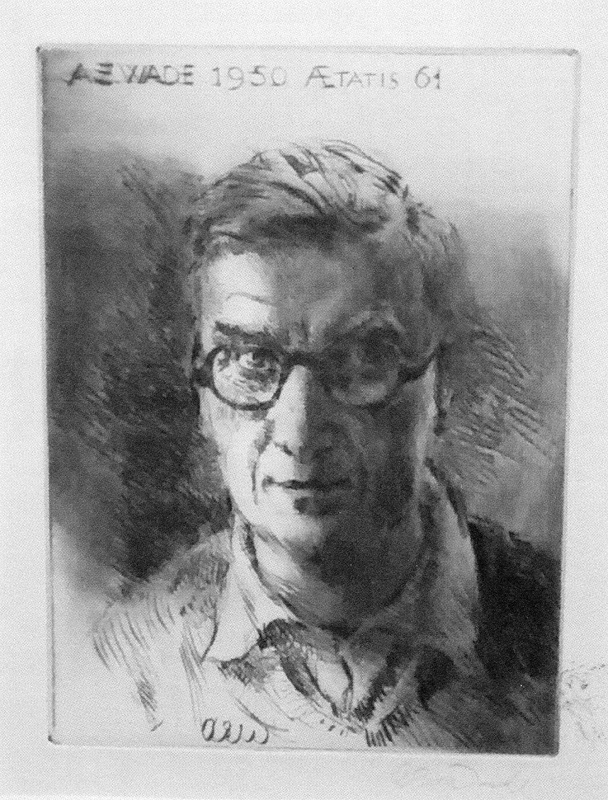 A photo of a self-portrait dated 1950, which states it is an image of him at age 61, and is held in this Grimsby collection, was provided by Louise Bowen, of the NE Lincolnshire Council Museum Collections department, in 2014. 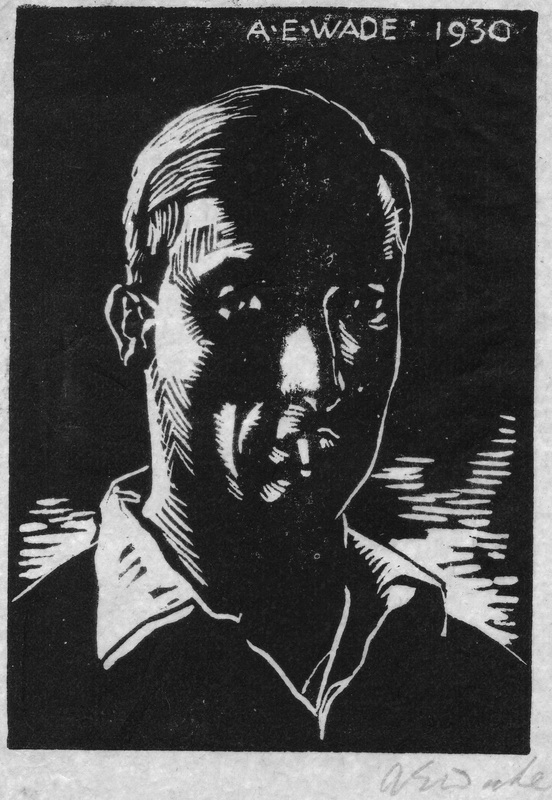 A drypoint image purporting to be a self portrait from 1930 was also found in his collection of dry-points, most of the rest of which dated from the 1960s. Albert was born on 17 October 1889, in Kinver, Staffordshire, and had parents Josiah and Mary Ann (nee Newell). In the 1911 Census records he is listed as a Draughtsman with a Furniture manufacturer, then aged 21, living at 3 Marlborough Road, Smallheath, near Birmingham, with his parents (aged 54 and 60) and brothers Sydney George aged 27, and Walker Charles aged 19. All of the rest of them were employed in the family Bakery. There were two other children of Josiah and Mary alive at that time, but not living in Marlborough Road. Albert Wade retired to Alresford in 1953: he chose Alresford “because his family had originated here” [the only record of any family connection is that his mother had been born in Farringdon, Hampshire – Ed]. Here, he made his home at Ivern, in Salisbury Road, where he lived for over 20 years: he died in 1976. 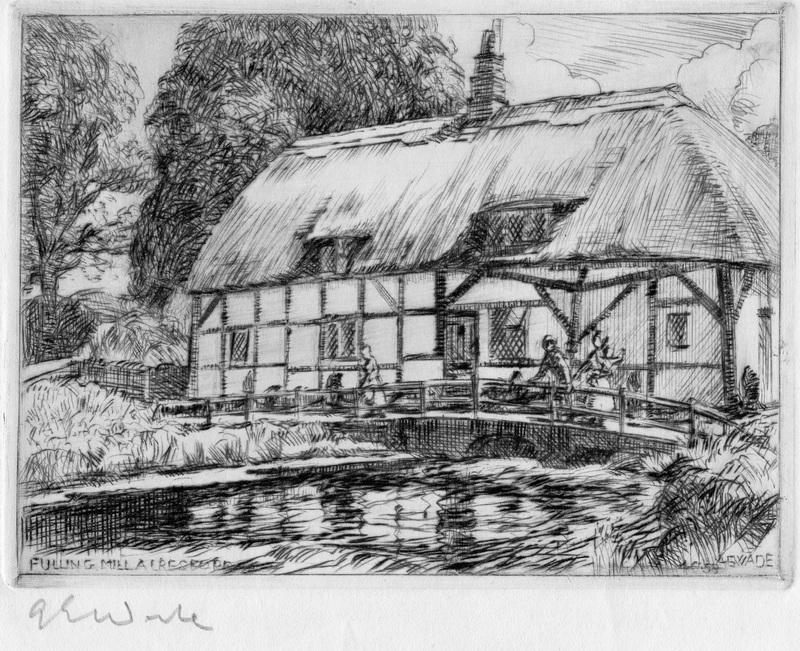 A good friendship was established with George Watson in Alresford, possibly via contact with Laurence Oxley’s shop, and George assisted Albert in printing the Christmas cards he made using a dry point technique, from the sketches reversed onto copper blocks. Later, George passed some of these blocks and prints to Roy Robins and his colleagues who were starting the Alresford Museum. Also included was a full sized painting, showing the dismantling of the water tower, on its site near the top of Jacklyn’s Lane in around 1953, which now hangs in Alresford Library. Another possible route for the Alresford Museum collection of the Wade cards seems to have been via Mrs Mary Horner, of the Manor House, Humberston, Grimsby: possibly a relation of Albert Wade. Mary Horner passed her set of cards to Peter Chapman, a reporter on the Grimsby Evening Telegraph. Peter Chapman felt the Alresford images would be better kept in Alresford, and passed them back to Christopher Everett in Holyborne, Alton, from where they came to the Alresford Historical and Literary Society, and then the Alresford Museum. “When 1950 dawned, Mr AE Wade had been Principal of Grimsby School of Art for 23 years. When he retired three years later, to Alresford, from which his family originated, his tenure of office was, and has subsequently proved, a record. But he left an eradicable mark – not only on the thousands of students who had sat at his feet – but on the town to which he had come in 1923 after a spell at Birmingham School of Art. Albert Wade was a man of many parts. He was first a devoted husband to Florence (née Hames). He was father to two daughters, Athena and Gabriel, to whom he passed many of his enthusiasms. He was a highly competent artist, in oils and watercolours, a master of the portrait, the landscape and specific studies. He was a sculptor and a highly skilled woodworker and carver. In addition to these many accomplishments he was a most useful cellist and an inveterate collector. His knowledge of, for instance, Chinese porcelain was encyclopaedic, and he amassed a still extant collection of Egyptian items which remains in Grimsby. Mr Wade was both a man of his time and a connoisseur, and he passed on his wide range of knowledge to his pupils, many of whom owe the awakening of many interests to his passions. In a letter to a friend dated 22 October 1959 – we can’t decipher the friend’s name – Wade explains “Drypoint” as engraved with a point (similar to an engraver’s burin) on the copper plate, and then printed – with no acid used, therefore it is a drypoint. But other descriptions of the technique highlight that it is the burr thrown up on the furrow of the line which is crucial to the final result, the angle of the dry point changing the characteristics of the burr. Lines in a drypoint print are characterised by a soft fuzziness caused by the ink delivered by the burr. Alresford Centre: a view of the Community Centre, Lloyds Bank and The Swan Hotel. Dated 21 May 1958. (13.5” diagonal). 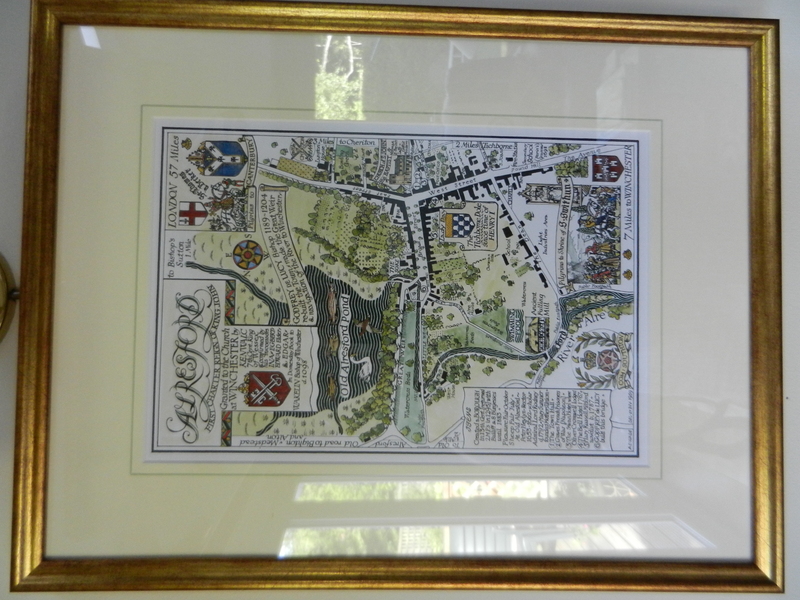 This is his major work in relation to Alresford, and its history. See below! 3. A larger print of the De Lucy Bridge, July 1968. (13.5” diagonal). 4. A larger print of the Fulling Mill picture, June 1958. (13.5” diagonal), as below. Not part of the Museum collection, but nevertheless available for public viewing in St John’s Church, is another Wade painting. This is the Royal Coat-of-Arms, positioned above the West door inside the Church, as shown below. Some of the original plates used to print the images on the Christmas cards have been passed on, and are in the Museum. The 1960 Winchester history plate was still wrapped in a newspaper dated 1960. In better condition are the plates for the De Lucy Bridge, the Fulling Mill, Alresford Churchyard and “Between the weirs”: plates are also present showing a portrait of Dr Meryon, and part of the Buttercross in Winchester. A 1968 newspaper protects another picture plate of Alresford Church, as viewed from Broad Street. Most of the original Wade prints, made directly from the copper, were produced in the basement at Oxley’s shop by George Watson, who worked there before starting his own picture framing and furniture repair business with his wife Beryl. Recently, ie in 2015, Oxley’s have made available for sale some hand coloured A4 sized versions of Wade’s town plan, originally drawn in 1959: but these are certainly modern paintings, possibly painted on modern prints of the image. Nevertheless they are a tribute to Wade and the images he produced. The photograph below is an image of one of these 2015 prints: it is deliberately taken as is, in situ. Ancestry.co.uk suggests Albert Wade married Florence Hames in Warwickshire, and has an engagement photo. Maybe someone can look it up on the Swanwick family tree, and let us know more? There is also another self-portrait listed there. I have the original engagement photograph, as well as his wedding certificate, death certificate and other documents. 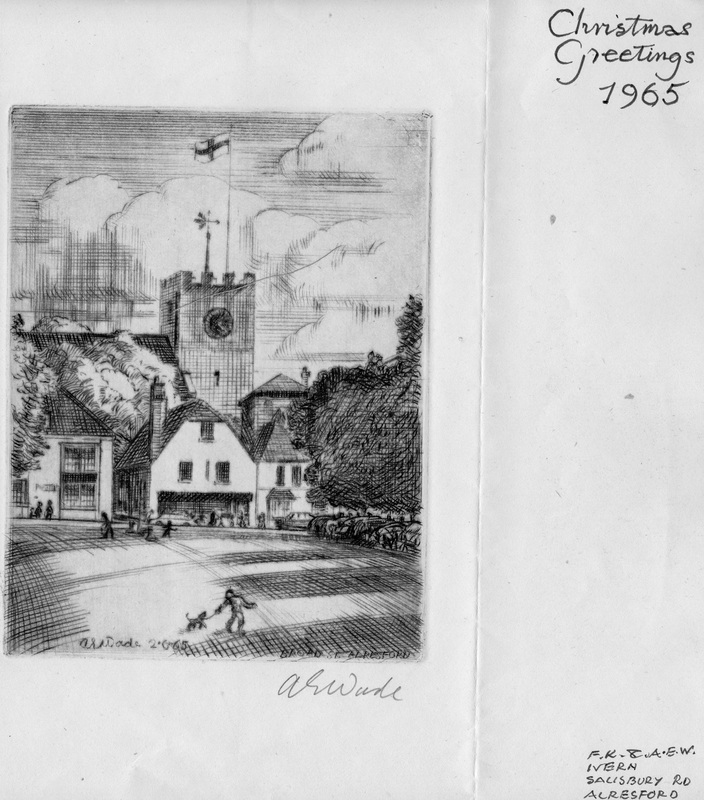 From the end of February 2015 the Albert Wade Christmas cards and dry-point prints of Alresford are on display, with some of the printing plates, in the Alresford Library museum cabinet in Broad Street. The display will be there until April.